I think Jessica Wingate and Elizabeth Azen are about to revolutionize your wardrobe. Their new business, Le Cou, has reintroduced the women’s dickey as something fun, fashionable, and easy to wear. 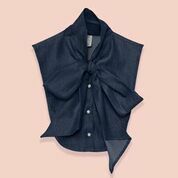 These simple little shirts can dress up and bring versatility to any woman’s wardrobe. Little Shirt: You might be asking yourself, “what is a dickey?” Or, you might just think of a dickey as the little fake ruffly shirt worn under tuxedos. In fact, the on-line Merriam Webster Dictionary’s first definition for a dickey is this – a man’s separate or detachable shirtfront. However, women have also historically worn dickeys, but I didn’t know this until I asked around and did a little research. Chemisette: Towards the end of the Victorian era, women wore what they called a chemisette, which was a small garment or lace to cover a low-cut bodice or neckline. Today, a dickey is a versatile garment worn under a layer of clothing to give the impression of a full shirt underneath. Jessica told me she learned about dickeys from her mother, who had been a flight attendant and who had several dickeys in her wardrobe. The New Dickey: Jessica brought along a few samples of Le Cou’s dickeys to our meeting. 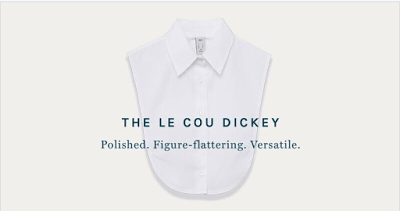 I have a colleague who wears Le Cou’s dickeys, but I was curious what they were really like. I was impressed. They are really quite simple. Some are fun, while others are more elegant. Jessica brought along a cheery blue gingham collared little shirt and a more blousey one with a neckline bow. Jessica pointed out the handy straps along the sides for easy fitting, and the smart neckline that fits nicely under sleeveless garments. Simple Solutions: The easy fit is one of the key benefits of Le Cou’s dickeys. Jessica shares that she got the idea to design and make dickeys after searching for garments that fit her properly. She also wanted a garment that was adjustable and versatile – something that was comfortable and stylish. All of Le Cou’s dickeys are made with modern fabrics and are manufactured locally. There are four basic styles that come in three sizes, and each style has multiple fabric options. Jessica says Le Cou and its dickeys are solution-based. Chic Redesign: If necessity is the mother of invention, it’s also the mother of redesign. Le Cou’s designs are unique and updated for today’s women. Unlike dickeys from the past, these are not false shirts, but tailored small shirts without the bulk of a full shirt. For example, the collared dickey I saw had functioning buttons all the way down. Jessica explained that you put the dickey on just a like a full shirt by using the buttons! But, on a hot summer day you’re much cooler, or you don’t feel constrained by all that extra bulk. 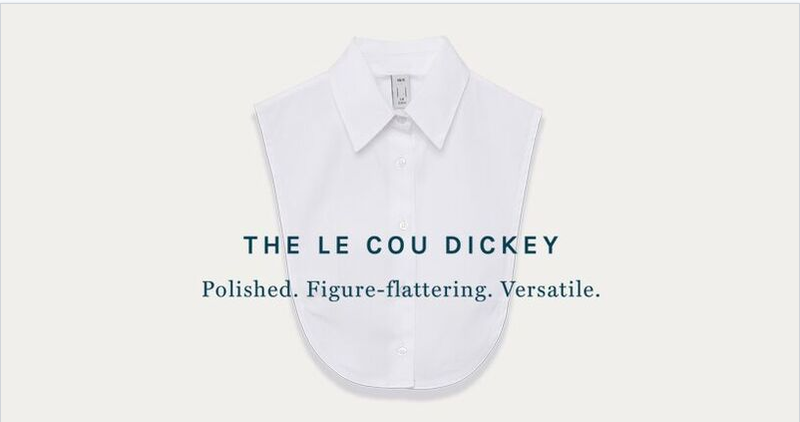 I’ll Take Two: Le Cou is off to a great start, and I predict dickeys will soon be one of the standard items in our wardrobes, like shells, sweaters, and jackets. We will be asking our friends, “who makes your favorite dickey?” Le Cou’s kick starter campaign was a huge success and I think the beginning of a wardrobe revolution. Le Cou is already seeing repeat customers – women who want multiple dickeys. Once you try one on, says Jessica, you are hooked and want more. They’re just so easy, cute and comfy. Designer Team: I’m not at all surprised Jessica and Elizabeth have designed a winning product. Although Elizabeth lives in New York and Jessica lives in Portland, Jessica and Elizabeth are friends from college and lived together in Spain. Jessica is the main designer and does a lot of the sourcing, while Elizabeth is in charge of PR, marketing and branding. They are truly a dynamic team. It is apparent how much Jessica loves what she’s doing. She admits she’s having a blast. She’s always had a love for fashion, and has a background in merchandising. Fashion Value: Jessica and Elizabeth have big plans for Le Cou and want to expand sizing options and create more styles. Right now, they’re addressing their biggest challenge – educating the consumer about the fashion value of their product. I think the education will go quickly, and we’ll all soon have Le Cou’s little shirts dressing up our wardrobes. Shop for your first or next Le Cou Dickey on-line at www.lecoulecou.com. Which Le Cou little shirt do you want? J'adore Le Cou! Great article!